For the past two years a group of experienced catechists, RE specialists, priests, the Diocesan Education Service and the Youth Ministry Team have been working on the new Diocesan Confirmation Programme, 'Come kindle in us the fire of your love', and their work is now nearing completion. The Programme will be formally launched in three venues across the Diocese with invitations to attend extended to all clergy and catechists. 'Come kindle in us the fire of your love' has been written to establish a consistent approach to the Sacrament of Confirmation across the Diocese. At Bishop Seamus' request, Candidates for Confirmation will begin preparation in their parish or deanery at any time from the beginning of Year 9 onwards. Individual parishes and deaneries will be free to prepare young people at a later age if they feel that is more appropriate. 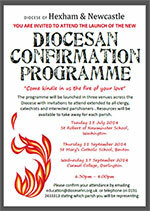 The Programme has been written following a diocesan wide consultation which was carried out in July 2013. During this consultation, a wide range of examples of good practice at parish and deanery level were collected and these have been used to inform the content of the Programme. A second consultation took place with the Diocesan Youth Council in March 2014. The voice of young people has provided a rich insight into what a successful and relevant programme should contain to meet the needs of the young person. The Programme consists of Parish Guidelines and a School Module. The Parish Guidelines will not give a prescriptive programme as such but will facilitate parishes in creating their own programme according to local need and drawing on the rich experience of priests and catechists shared during the process of consultation. In response to requests from priests and catechists, the programme will include suggested themes, approaches and liturgies for sessions with candidates and parents. The Guidelines will also include a foreword from Bishop Seamus, a clarification of the roles of parishes, deaneries, catechists, sponsors, parents and young people, and ideas for establishing and forming a team of catechists, planning the programme, planning the Confirmation Mass and post-Confirmation activities, and making links with the high school. The School Module has been produced by a team of RE specialists from across the Diocese. This new module will become a part of curricular RE in all of our Secondary schools and will be taught to all Year 8 students in the last half-term of the academic year beginning in June of this year. It contains eight detailed individual lesson plans and background notes for teachers. This has already been shared successfully with schools and further CPD will be provided by the Diocesan Education Service to all teachers involved in the delivery of this module. A modified version of this module is being produced for use by clergy and catechists in those areas of our Diocese without Catholic Schools. The Parish Guidelines will build on this foundation of knowledge gained through the School Module. A full explanation of the new Programme will be given at the launch and copies will be available to take away for each parish. We hope these new resources will be of great benefit to the young people of our Diocese and those preparing them for the reception of this Sacrament. On the occasion of their Confirmation in Rome in 2013, Pope Francis told a group of young people: 'Remain steadfast in the journey of faith, with firm hope in the Lord. This is the secret of our journey! He gives us the courage to swim against the tide.' Pope Francis invited the young people to be guided by the Holy Spirit so as to do nothing less than to transform the world. We hope that the 'Come kindle in us the fire of your love' will enable our young people to be formed so that they can transform the world.